Black Friday deals drove demand for savvy shoppers, and now those who waited until the last minute to purchase their holiday gifts can learn from the sacrifices of the brave Black Friday Warrior. To help make everyone’s last minute holiday shopping easier, Argus Insights looked to consumer reviews just before and after Black Friday to see what consumers bought, liked, and are likely to buy more of as December continues. 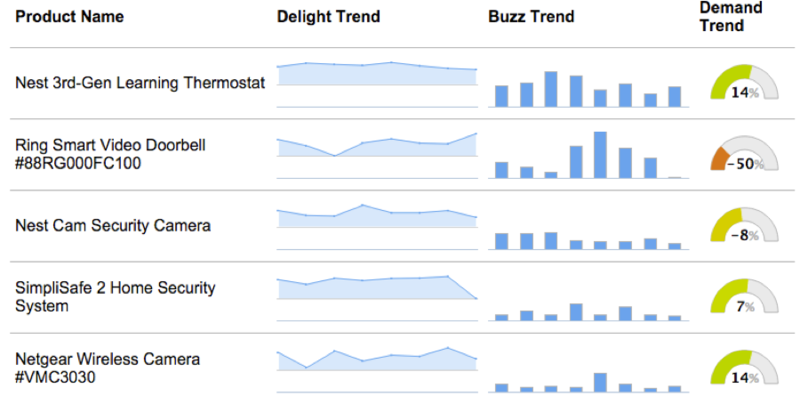 Smart Home consumers were really buzzing about Nest’s 3rd Generation Thermostat. Buzz and delight grew for this device leading up to Black Friday, and demand will likely continue on a positive path throughout December. The Nest Cam was also a popular Smart Home pick, but a combination of diminishing delight and buzz make it unlikely that demand will surge anytime soon. Consumers busted down doors to get their hands on a Ring Smart Video Doorbell, as buzz for this product built to a peak just after Black Friday. While the video doorbell was a popular Black Friday pick, this demand momentum will likely fizzle as the holiday season continues. SimpliSafe’s second edition Home Security System and Netgear’s Wireless Camera round out the most popular Smart Home Devices of Black Friday. SimpliSafe sustained high delight through Black Friday, only to see delight fall in early December. Despite this decrease, there is a small chance this security system will see demand increase. Delight for Netgear’s camera grew after a peak in buzz on Black Friday and the device is likely to delight even more consumers in the coming weeks. Happy Shopping & Happy Holidays! If you want regular insights into the Smart Home market, check out our full 20/20 Demand Scorecards. Insights are updated every month for Security Cameras, Home Security Kits & Hubs, Smartwatches, Smartphones, and several other markets. For free weekly insights, sign up for our newsletters.